Location in Central Washington, D.C. Following his April 1789 inauguration, President George Washington occupied two executive mansions in New York City: the Samuel Osgood House at 3 Cherry Street (April 1789 – February 1790), and the Alexander Macomb House at 39–41 Broadway (February–August 1790). In May 1790, New York began construction of Government House for his official residence, but he never occupied it. The national capital moved to Philadelphia in December 1790. The July 1790 Residence Act named Philadelphia, Pennsylvania the temporary national capital for a 10-year period while the Federal City was under construction. The City of Philadelphia rented Robert Morris's city house at 190 High Street (now 524–30 Market Street) for Washington's presidential residence. The first U.S. President occupied the Market Street mansion from November 1790 to March 1797 and altered it in ways that may have influenced the design of the White House. As part of a futile effort to have Philadelphia named the permanent national capital, Pennsylvania built a much grander presidential mansion several blocks away, but Washington declined to occupy it. President John Adams also occupied the Market Street mansion from March 1797 to May 1800. On Saturday, November 1, 1800, he became the first president to occupy the White House. The President's House in Philadelphia became a hotel and was demolished in 1832, while the unused presidential mansion became home to the University of Pennsylvania. Government House, Manhattan, New York (1790–1791). Built to be the permanent presidential mansion, Congress moved the national capital to Philadelphia before its completion. House intended for the President, Philadelphia, Pennsylvania (1790s). Built to be the permanent presidential mansion, neither Washington nor Adams would occupy it. The President's House was a major feature of Pierre (Peter) Charles L'Enfant's' plan for the newly established federal city, Washington, D.C. (see: L'Enfant Plan). The architect of the White House was chosen in a design competition which received nine proposals, including one submitted anonymously by Thomas Jefferson. President Washington visited Charleston, South Carolina in May 1791 on his "Southern Tour", and saw the under-construction Charleston County Courthouse designed by Irish architect James Hoban. He is reputed to have met with Hoban then. The following year, he summoned the architect to Philadelphia and met with him in June 1792. On July 16, 1792, the President met with the commissioners of the federal city to make his judgment in the architectural competition. His review is recorded as being brief, and he quickly selected Hoban's submission. The building has classical inspiration sources, that could be found directly or indirectly in the Roman architect Vitruvius or in Andrea Palladio styles; Palladio being an Italian architect of the Renaissance which had a considerable influence on the Western architecture (Palladian architecture). The building Hoban designed is verifiably influenced by the upper floors of Leinster House, in Dublin, which later became the seat of the Oireachtas (the Irish parliament). Several other Georgian-era Irish country houses have been suggested as sources of inspiration for the overall floor plan, details like the bow-fronted south front, and interior details like the former niches in the present Blue Room. These influences, though undocumented, are cited in the official White House guide, and in White House Historical Association publications. The first official White House guide, published in 1962, suggested a link between Hoban's design for the South Portico and Château de Rastignac, a neoclassical country house located in La Bachellerie in the Dordogne region of France and designed by Mathurin Salat. Construction on the French house was initially started before 1789, interrupted by the French Revolution for twenty years and then finally built 1812–1817 (based on Salat's pre-1789 design). The theoretical link between the two houses has been criticized because Hoban did not visit France. Supporters of a connection posit that Thomas Jefferson, during his tour of Bordeaux in 1789, viewed Salat's architectural drawings (which were on-file at the College) at the École Spéciale d'Architecture (Bordeaux Architectural College). On his return to the U.S. he then shared the influence with Washington, Hoban, Monroe, and Benjamin Henry Latrobe. Construction of the White House began with the laying of the cornerstone on October 13, 1792, although there was no formal ceremony. The main residence, as well as foundations of the house, were built largely by enslaved and free African-American laborers, as well as employed Europeans. Much of the other work on the house was performed by immigrants, many not yet with citizenship. The sandstone walls were erected by Scottish immigrants, employed by Hoban, as were the high-relief rose and garland decorations above the north entrance and the "fish scale" pattern beneath the pediments of the window hoods. There are conflicting claims as to where the sandstone used in the construction of the White House originated. Some reports suggest sandstone from the Croatian island of Brač (specifically the Pučišća querry whose stone was used to build the ancient Roman palace of Emperor Diocletian) was used in the original construction of the building, contrarily researchers believe limestone from the island was used in the 1902 renovations and not the original construction. Others suggest the original sandstone simply came from Aquia Creek in Stafford County, Virginia, as importing the stone would be too costly. The initial construction took place over a period of eight years, at a reported cost of $232,371.83 (equal to $3,430,446 today). Although not yet completed, the White House was ready for occupancy circa November 1, 1800. Shortages, including material and labor, forced alterations to the earlier plan developed by French engineer Pierre Charles L'Enfant for a "palace" that was five times larger than the house that was eventually built. The finished structure contained only two main floors instead of the planned three, and a less costly brick served as a lining for the stone façades. When construction was finished, the porous sandstone walls were whitewashed with a mixture of lime, rice glue, casein, and lead, giving the house its familiar color and name. As it is a famed structure in America, several replicas of the White House have been constructed. The north front is the principal façade of the White House and consists of three floors and eleven bays. The ground floor is hidden by a raised carriage ramp and parapet, thus the façade appears to be of two floors. The central three bays are behind a prostyle portico (this was a later addition to the house, built circa 1830) serving, thanks to the carriage ramp, as a porte cochere. The windows of the four bays flanking the portico, at first-floor level, have alternating pointed and segmented pediments, while at second-floor level the pediments are flat. The principal entrance at the center of the portico is surmounted by a lunette fanlight. Above the entrance is a sculpted floral festoon. The roofline is hidden by a balustraded parapet. The mansion's southern façade is a combination of the Palladian and neoclassical styles of architecture. It is of three floors, all visible. The ground floor is rusticated in the Palladian fashion. At the center of the façade is a neoclassical projecting bow of three bays. The bow is flanked by five bays, the windows of which, as on the north façade, have alternating segmented and pointed pediments at first-floor level. The bow has a ground floor double staircase leading to an Ionic colonnaded loggia (with the Truman Balcony at second-floor level), known as the south portico. The more modern third floor is hidden by a balustraded parapet and plays no part in the composition of the façade. The building was originally variously referred to as the "President's Palace", "Presidential Mansion", or "President's House". 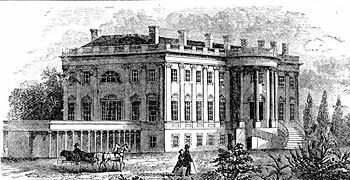 The earliest evidence of the public calling it the "White House" was recorded in 1811. A myth emerged that during the rebuilding of the structure after the Burning of Washington, white paint was applied to mask the burn damage it had suffered, giving the building its namesake hue. The name "Executive Mansion" was used in official contexts until President Theodore Roosevelt established the formal name by having "White House–Washington" engraved on the stationery in 1901. The current letterhead wording and arrangement "The White House" with the word "Washington" centered beneath goes back to the administration of Franklin D. Roosevelt. Although the structure was not completed until some years after the presidency of George Washington, there is speculation that the name of the traditional residence of the President of the United States may have derived from Martha Washington's home, White House Plantation in Virginia, where the nation's first President had courted the First Lady in the mid-18th century. On Saturday, November 1, 1800, John Adams became the first president to take residence in the building. The next day he wrote his wife Abigail: "I pray Heaven to bestow the best of blessings on this House, and all that shall hereafter inhabit it. May none but honest and wise men ever rule under this roof." Franklin D. Roosevelt had Adams's blessing carved into the mantel in the State Dining Room. Adams lived in the house only briefly before Thomas Jefferson moved into the "pleasant country residence" in 1801. Despite his complaints that the house was too big ("big enough for two emperors, one pope, and the grand lama in the bargain"), Jefferson considered how the White House might be added to. With Benjamin Henry Latrobe, he helped lay out the design for the East and West Colonnades, small wings that help conceal the domestic operations of laundry, a stable and storage. Today, Jefferson's colonnades link the residence with the East and West Wings. 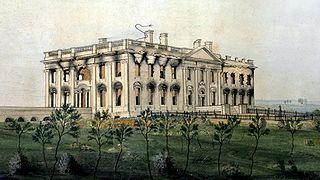 In 1814, during the War of 1812, the White House was set ablaze by British troops during the Burning of Washington, in retaliation for burning of Port Dover and other towns in Upper Canada; much of Washington was affected by these fires as well. Only the exterior walls remained, and they had to be torn down and mostly reconstructed because of weakening from the fire and subsequent exposure to the elements, except for portions of the south wall. Of the numerous objects taken from the White House when it was ransacked by British troops, only two have been recovered. Employees and slaves rescued a painting of George Washington, and in 1939, a Canadian man returned a jewelry box to President Franklin D. Roosevelt, claiming that his grandfather had taken it from Washington. Some observers allege that most of these spoils were lost when a convoy of British ships led by HMS Fantome sank en route to Halifax off Prospect during a storm on the night of November 24, 1814, even though Fantome had no involvement in that action. After the fire, President James Madison resided in The Octagon House from 1814 to 1815, and then the Seven Buildings from 1815 to the end of his term. Meanwhile, both architect Benjamin Henry Latrobe and Hoban contributed to the design and oversight of the reconstruction, which lasted from 1815 until 1817. The south portico was constructed in 1824 during the James Monroe administration; the north portico was built six years later. Though Latrobe proposed similar porticos before the fire in 1814, both porticos were built as designed by Hoban. An elliptical portico at Château de Rastignac in La Bachellerie, France with nearly identical curved stairs is speculated as the source of inspiration due to its similarity with the South Portico, although this matter is one of great debate. Italian artisans, brought to Washington to help in constructing the U.S. Capitol, carved the decorative stonework on both porticos. Contrary to speculation, the North Portico was not modeled on a similar portico on another Dublin building, the Viceregal Lodge (now Áras an Uachtaráin, residence of the President of Ireland), for its portico postdates the White House porticos' design. For the North Portico, a variation on the Ionic Order was devised incorporating a swag of roses between the volutes. This was done to link the new portico with the earlier carved roses above the entrance. Jefferson and Latrobe's West Wing Colonnade, in this nineteenth-century engraved view, is now the James S. Brady Press Briefing Room. By the time of the American Civil War, the White House had become overcrowded. The location of the White House was questioned, just north of a canal and swampy lands, which provided conditions ripe for malaria and other unhealthy conditions. Brigadier General Nathaniel Michler was tasked to propose solutions to address these concerns. He proposed abandoning the use of the White House as a residence and designed a new estate for the first family at Meridian Hill in Washington, D.C., but Congress rejected the plan. Additions proposed by architect Frederick D. Owen (1901). When Chester A. Arthur took office in 1881, he ordered renovations to the White House to take place as soon as the recently widowed Lucretia Garfield moved out. Arthur inspected the work almost nightly and made several suggestions. Louis Comfort Tiffany was asked to send selected designers to assist. Over twenty wagonloads of furniture and household items were removed from the building and sold at a public auction. All that was saved were bust portraits of John Adams and Martin Van Buren. A proposal was made to build a new residence south of the White House, but it failed to gain support. In the fall of 1882 work was done on the main corridor, including tinting the walls pale olive and adding squares of gold leaf, and decorating the ceiling in gold and silver, and colorful traceries woven to spell "USA". The Red Room was painted a dull Pomeranian red, and its ceiling was decorated with gold, silver, and copper stars and stripes of red, white, and blue. A fifty-foot jeweled Tiffany glass screen, supported by imitation marble columns, replaced the glass doors that separated the main corridor from the north vestibule. In 1891, First Lady Caroline Harrison proposed major extensions to the White House, including a National Wing on the east for a historical art gallery, and a wing on the west for official functions. A plan was devised by Colonel Theodore A. Bingham, which reflected the Harrison proposal. These plans were ultimately rejected. However, in 1902 Theodore Roosevelt hired McKim, Mead & White to carry out expansions and renovations in a neoclassical style suited to the building's architecture, removing the Tiffany screen and all Victorian additions. Charles McKim himself designed and managed the project, which gave more living space to the President's large family by removing a staircase in the West Hall and moving executive office staff from the second floor of the residence into the new West Wing. President William Howard Taft enlisted the help of architect Nathan C. Wyeth to add additional space to the West Wing, which included the addition of the Oval Office. In 1925, Congress enacted legislation allowing the White House to accept gifts of furniture and art for the first time. The West Wing was damaged by fire in 1929, but rebuilt during the remaining years of the Herbert Hoover presidency. In the 1930s, a second story was added, as well as a larger basement for White House staff, and President Franklin Roosevelt had the Oval Office moved to its present location: adjacent to the Rose Garden. Decades of poor maintenance, the construction of a fourth story attic during the Coolidge administration, and the addition of a second-floor balcony over the south portico for Harry S. Truman took a great toll on the brick and sandstone structure built around a timber frame. By 1948, the house was declared to be in imminent danger of collapse, forcing President Truman to commission a reconstruction and to live across the street at Blair House from 1949 to 1951. The work, done by the firm of Philadelphia contractor John McShain, required the complete dismantling of the interior spaces, construction of a new load-bearing internal steel frame and the reconstruction of the original rooms within the new structure. The total cost of the renovations was about $5.7 million (US$55 million in 2019). Some modifications to the floor plan were made, the largest being the repositioning of the grand staircase to open into the Entrance Hall, rather than the Cross Hall. Central air conditioning was added, as well as two additional sub-basements providing space for workrooms, storage, and a bomb shelter. The Trumans moved back into the White House on March 27, 1952. While the house's structure was kept intact by the Truman reconstruction, much of the new interior finishes were generic, and of little historic value. Much of the original plasterwork, some dating back to the 1814–1816 rebuilding, was too damaged to reinstall, as was the original robust Beaux Arts paneling in the East Room. President Truman had the original timber frame sawed into paneling; the walls of the Vermeil Room, Library, China Room, and Map Room on the ground floor of the main residence were paneled in wood from the timbers. Jacqueline Kennedy, wife of President John F. Kennedy (1961–63), directed a very extensive and historic redecoration of the house. She enlisted the help of Henry Francis du Pont of the Winterthur Museum to assist in collecting artifacts for the mansion, many of which had once been housed there. Other antiques, fine paintings, and improvements of the Kennedy period were donated to the White House by wealthy philanthropists, including the Crowninshield family, Jane Engelhard, Jayne Wrightsman, and the Oppenheimer family. Stéphane Boudin of the House of Jansen, a Paris interior-design firm that had been recognized worldwide, was employed by Jacqueline Kennedy to assist with the decoration. Different periods of the early republic and world history were selected as a theme for each room: the Federal style for the Green Room, French Empire for the Blue Room, American Empire for the Red Room, Louis XVI for the Yellow Oval Room, and Victorian for the President's study, renamed the Treaty Room. Antique furniture was acquired, and decorative fabric and trim based on period documents was produced and installed. The Kennedy restoration resulted in a more authentic White House of grander stature, which recalled the French taste of Madison and Monroe. In the Diplomatic Reception Room, Mrs. Kennedy installed an antique "Vue de l'Amérique Nord" wallpaper which Zuber & Cie had designed in 1834. The wallpaper had hung previously on the walls of another mansion until 1961 when that house was demolished for a grocery store. Just before the demolition, the wallpaper was salvaged and sold to the White House. The first White House guidebook was produced under the direction of curator Lorraine Waxman Pearce with direct supervision from Mrs. Kennedy. Sale of the guidebook helped finance the restoration. Kennedy showed her restoration of the White House to the public in a televised tour of the house on Valentine's Day in 1962. Congress enacted legislation in September 1961 declaring the White House a museum. Furniture, fixtures, and decorative arts could now be declared either historic or of artistic interest by the President. This prevented them from being sold (as many objects in the executive mansion had been in the past 150 years). When not in use or display at the White House, these items were to be turned over to the Smithsonian Institution for preservation, study, storage, or exhibition. The White House retains the right to have these items returned. Out of respect for the historic character of the White House, no substantive architectural changes have been made to the house since the Truman renovation. Since the Kennedy restoration, every presidential family has made some changes to the private quarters of the White House, but the Committee for the Preservation of the White House must approve any modifications to the State Rooms. Charged with maintaining the historical integrity of the White House, the congressionally authorized committee works with each First Family—usually represented by the First Lady, the White House Curator, and the Chief Usher—to implement the family's proposals for altering the house. During the Nixon Administration (1969–1974), First Lady Pat Nixon refurbished the Green Room, Blue Room, and Red Room, working with Clement Conger, the curator appointed by President Richard Nixon. Mrs. Nixon's efforts brought more than 600 artifacts to the house, the largest acquisition by any administration. Her husband created the modern press briefing room over Franklin Roosevelt's old swimming pool. Nixon also added a single-lane bowling alley to the White House basement. Computers and the first laser printer were added during the Carter administration, and the use of computer technology was expanded during the Reagan administration. A Carter-era innovation, a set of solar water heating panels that were mounted on the roof of the White House, was removed during Reagan's presidency. 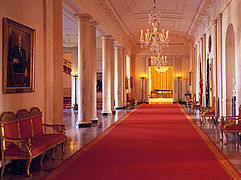 Redecorations were made to the private family quarters and maintenance was made to public areas during the Reagan years. The house was accredited as a museum in 1988. In the 1990s, Bill and Hillary Clinton refurbished some rooms with the assistance of Arkansas decorator Kaki Hockersmith, including the Oval Office, the East Room, Blue Room, State Dining Room, Lincoln Bedroom, and Lincoln Sitting Room. During the administration of George W. Bush, First Lady Laura Bush refurbished the Lincoln Bedroom in a style contemporary with the Lincoln era; the Green Room, Cabinet Room, and theater were also refurbished. The White House became one of the first wheelchair-accessible government buildings in Washington when modifications were made during the presidency of Franklin D. Roosevelt, who used a wheelchair because of his paralytic illness. In the 1990s, Hillary Clinton, at the suggestion of Visitors Office Director Melinda N. Bates, approved the addition of a ramp in the East Wing corridor. It allowed easy wheelchair access for the public tours and special events that enter through the secure entrance building on the east side. In 2003, the Bush administration reinstalled solar thermal heaters. These units are used to heat water for landscape maintenance personnel and for the presidential pool and spa. 167 solar photovoltaic grid-tied panels were installed at the same time on the roof of the maintenance facility. The changes were not publicized as a White House spokeswoman said the changes were an internal matter. The story was picked up by industry trade journals. In 2013, President Barack Obama had a set of solar panels installed on the roof of the White House, making it the first time solar power would be used for the president's living quarters. Today the group of buildings housing the presidency is known as the White House Complex. It includes the central Executive Residence flanked by the East Wing and West Wing. The Chief Usher coordinates day to day household operations. The White House includes: six stories and 55,000 ft2 (5,100 m2) of floor space, 132 rooms and 35 bathrooms, 412 doors, 147 windows, twenty-eight fireplaces, eight staircases, three elevators, five full-time chefs, a tennis court, a (single-lane) bowling alley, a movie theater (officially called the White House Family Theater), a jogging track, a swimming pool, and a putting green. It receives up to 30,000 visitors each week. The original residence is in the center. Two colonnades—one on the east and one on the west—designed by Jefferson, now serve to connect the East and West Wings added later. The Executive Residence houses the president's dwelling, as well as rooms for ceremonies and official entertaining. The State Floor of the residence building includes the East Room, Green Room, Blue Room, Red Room, State Dining Room, Family Dining Room, Cross Hall, Entrance Hall, and Grand Staircase. The Ground Floor is made up of the Diplomatic Reception Room, Map Room, China Room, Vermeil Room, Library, the main kitchen, and other offices. The second floor family residence includes the Yellow Oval Room, East and West Sitting Halls, the White House Master Bedroom, President's Dining Room, the Treaty Room, Lincoln Bedroom and Queens' Bedroom, as well as two additional bedrooms, a smaller kitchen, and a private dressing room. The third floor consists of the White House Solarium, Game Room, Linen Room, a Diet Kitchen, and another sitting room (previously used as President George W. Bush's workout room). The West Wing houses the President's office (the Oval Office) and offices of his senior staff, with room for about 50 employees. It also includes the Cabinet Room, where the president conducts business meetings and where the Cabinet meets, as well as the White House Situation Room, James S. Brady Press Briefing Room, and Roosevelt Room. In 2007, work was completed on renovations of the press briefing room, adding fiber optic cables and LCD screens for the display of charts and graphs. The makeover took 11 months and cost of $8 million, out of which news outlets paid $2 million. In September 2010, a two-year project began on the West Wing, creating a multistory underground structure; this will be followed with additional renovation of the wing. The Oval Office, Roosevelt Room, and other portions of the West Wing were partially replicated on a sound stage and used as the setting for the popular television show The West Wing. The East Wing, which contains additional office space, was added to the White House in 1942. Among its uses, the East Wing has intermittently housed the offices and staff of the First Lady, and the White House Social Office. Rosalynn Carter, in 1977, was the first to place her personal office in the East Wing and to formally call it the "Office of the First Lady". The East Wing was built during World War II in order to hide the construction of an underground bunker to be used in emergencies. The bunker has come to be known as the Presidential Emergency Operations Center. The White House and grounds cover just over 18 acres (about 7.3 hectares). Before the construction of the North Portico, most public events were entered from the South Lawn, which was graded and planted by Thomas Jefferson. Jefferson also drafted a planting plan for the North Lawn that included large trees that would have mostly obscured the house from Pennsylvania Avenue. During the mid-to-late 19th century a series of ever larger greenhouses were built on the west side of the house, where the current West Wing is located. During this period, the North Lawn was planted with ornate carpet-style flowerbeds. The general layout of the White House grounds today is based on the 1935 design by Frederick Law Olmsted Jr. of the Olmsted Brothers firm, commissioned by President Franklin D. Roosevelt. During the Kennedy administration, the White House Rose Garden was redesigned by Rachel Lambert Mellon. The Rose Garden borders the West Colonnade. Bordering the East Colonnade is the Jacqueline Kennedy Garden, which was begun by Jacqueline Kennedy but completed after her husband's assassination. On the weekend of June 23, 2006, a century-old American Elm (Ulmus americana L.) tree on the north side of the building came down during one of the many storms amid intense flooding. Among the oldest trees on the grounds are several magnolias (Magnolia grandiflora) planted by Andrew Jackson, including the Jackson Magnolia, reportedly grown from a sprout taken from the favorite tree of Jackson's recently deceased wife, the sprout planted after Jackson moved into the White House. The tree stood for over 200 years; but in 2017, having become too weak to stand on its own, it was decided it should be removed and replaced with one of its offspring. Michelle Obama planted the White House's first organic garden and installed beehives on the South Lawn of the White House, which will supply organic produce and honey to the First Family and for state dinners and other official gatherings. Marine One prepares to land on the South Lawn, where State Arrival Ceremonies are held. Like the English and Irish country houses it was modeled on, the White House was, from the start, open to the public until the early part of the 20th century. President Thomas Jefferson held an open house for his second inaugural in 1805, and many of the people at his swearing-in ceremony at the Capitol followed him home, where he greeted them in the Blue Room. Those open houses sometimes became rowdy: in 1829, President Andrew Jackson had to leave for a hotel when roughly 20,000 citizens celebrated his inauguration inside the White House. His aides ultimately had to lure the mob outside with washtubs filled with a potent cocktail of orange juice and whiskey. Even so, the practice continued until 1885, when newly elected Grover Cleveland arranged for a presidential review of the troops from a grandstand in front of the White House instead of the traditional open house. Jefferson also permitted public tours of his house, which have continued ever since, except during wartime, and began the tradition of annual receptions on New Year's Day and on the Fourth of July. Those receptions ended in the early 1930s, although President Bill Clinton briefly revived the New Year's Day open house in his first term. 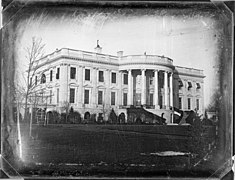 The White House remained accessible in other ways; President Abraham Lincoln complained that he was constantly beleaguered by job seekers waiting to ask him for political appointments or other favors, or eccentric dispensers of advice like "General" Daniel Pratt, as he began the business day. Lincoln put up with the annoyance rather than risk alienating some associate or friend of a powerful politician or opinion maker. In February 1974, a stolen army helicopter landed without authorization on the White House's grounds. Twenty years later, in 1994, a light plane flown by Frank Eugene Corder crashed on the White House grounds, and he died instantly. 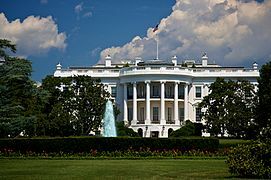 As a result of increased security regarding air traffic in the capital, the White House was evacuated in May 2005 before an unauthorized aircraft could approach the grounds. On May 20, 1995, primarily as a response to the Oklahoma City bombing of April 19, 1995, the United States Secret Service closed off Pennsylvania Avenue to vehicular traffic in front of the White House from the eastern edge of Lafayette Park to 17th Street. Later, the closure was extended an additional block to the east to 15th Street, and East Executive Avenue, a small street between the White House and the Treasury Building. After September 11, 2001, this was made permanent in addition to closing E Street between the South Portico of the White House and the Ellipse. In response to the Boston Marathon bombing, the road was closed to the public in its entirety for a period of two days. The Pennsylvania Avenue closing has been opposed by organized civic groups in Washington, D.C. They argue that the closing impedes traffic flow unnecessarily and is inconsistent with the well-conceived historic plan for the city. As for security considerations, they note that the White House is set much farther back from the street than numerous other sensitive federal buildings are. Prior to its inclusion within the fenced compound that now includes the Old Executive Office Building to the west and the Treasury Building to the east, this sidewalk served as a queuing area for the daily public tours of the White House. These tours were suspended in the wake of the September 11 attacks. In September 2003, they resumed on a limited basis for groups making prior arrangements through their Congressional representatives or embassies in Washington for foreign nationals and submitting to background checks, but the White House remained closed to the public. White House tours were suspended for most of 2013 due to budget constraints after sequestration. The White House reopened to the public in November 2013. The White House Complex is protected by the United States Secret Service and the United States Park Police. NASAMS (Norwegian Advanced Surface to Air Missile System) were used to guard air space over Washington, D.C. during the 2005 presidential inauguration. The same NASAMS units have since been used to protect the president and all airspace around the White House, which is strictly prohibited to aircraft. For security reasons, the section of Pennsylvania Avenue on the north side of the White House is closed to all vehicular traffic, except government officials. North front of the White House on the reverse (back) of the U.S. $20 bill. ^ "John Adams moves into White House". History.com. ^ "Inside the White House: History". WhiteHouse.gov. Retrieved January 21, 2017. ^ Michael W. Fazio and Patrick A. Snadon (2006). The Domestic Architecture of Benjamin Henry Latrobe. The Johns Hopkins University Press. pp. 364–366. ^ Brandus, Paul (2015). "Nov. 1, 1800: The White House Welcomes Its First President—John Adams". Under This Roof: A History of the White House and Presidency. Lyon Press. Archived from the original on November 23, 2016. Retrieved March 4, 2017 – via West Wing Reports. ^ "Timelines-Architecture" (PDF). White House Historical Association. p. 1. Archived from the original (PDF) on December 30, 2006. Retrieved November 13, 2007. ^ L'Enfant identified himself as "Peter Charles L'Enfant" during most of his life while residing in the United States. He wrote this name on his "Plan of the city intended for the permanent seat of the government of t(he) United States ...." (Washington, D.C.) and on other legal documents. However, during the early 1900s, a French ambassador to the U.S., Jean Jules Jusserand, popularized the use of L'Enfant's birth name, "Pierre Charles L'Enfant". (Reference: Bowling, Kenneth R (2002). Peter Charles L'Enfant: vision, honor, and male friendship in the early American Republic. George Washington University, Washington, D.C. ISBN 978-0-9727611-0-9). The United States Code states in 40 U.S.C. § 3309: "(a) In General.—The purposes of this chapter shall be carried out in the District of Columbia as nearly as may be practicable in harmony with the plan of Peter Charles L'Enfant." The National Park Service identifies L'Enfant as "Major Peter Charles L'Enfant" and as "Major Pierre (Peter) Charles L'Enfant" on its website. ^ Frary, Ihna Thayer (1969). They Built the Capitol. Ayer Publishing. p. 27. ISBN 978-0-8369-5089-2. ^ William Seale, "James Hoban: Builder of the White House" in White House History no. 22 (Spring 2008), pp. 8–12. ^ "Primary Document Activities". White House Historical Association. Archived from the original on November 9, 2007. Retrieved November 13, 2007. ^ "The White House". National Park Service. Retrieved November 13, 2007. ^ a b Johnson, Michael (May 10, 2006). "Our White House in France?". TheColumnists.Com. Archived from the original on July 4, 2011. Retrieved February 24, 2017. ^ Johnson, Michael (September 15, 2006). "A chateau fit for a president". New York Times. Retrieved June 1, 2011. ^ Ecker, Grace Dunlop (1933). A Portrait of Old Georgetown. Garrett & Massie, Inc. p. 36. ^ "African Americans in the White House Timeline". White House Historical Association. Retrieved March 21, 2016. ^ a b c d e f g h i j k l "White House Tour Essays: The Overview". White House Historical Association. Archived from the original on October 28, 2007. Retrieved November 7, 2007. ^ Zentz, Wendy (November 9, 1986). "Yugoslavs Claim Bit Of White House". SunSentinel. Retrieved February 13, 2018. ^ Podolak, Janet (October 17, 2010). "Stone from island off Croatia made White House and ancient Roman palace". The News-Herald. Retrieved February 13, 2018. ^ "Croatia's Stone industry is expanding". www.litosonline.com. Retrieved February 13, 2018. ^ "Overview of the White House". White House Museum. Retrieved November 9, 2007. ^ Seale, William (1986). The President's House, A History. Volume I. White House Historical Association. pp. 1, 23. ISBN 978-0-912308-28-9. ^ Seale, William (1992). The White House, The History of an American Idea. The American Institute of Architects Press. pp. 35. 1. ISBN 978-1-55835-049-6. ^ Unger, Harlow (2009). The Last Founding Father:James Monroe and a Nation's Call to Greatness. New York: Da Capo Press. p. 277. ISBN 978-0-306-81808-0. ^ Seale, William (1986). The President's House, A History. Volume II. White House Historical Association. p. 689.1. ISBN 978-0-912308-28-9. ^ a b c "White House Facts". The White House. Archived from the original on October 10, 2007. Retrieved February 24, 2017. ^ K.W. Poore and Associates, Inc.; Earth Design Associates, Inc. (June 2, 2002). "New Kent County Comprehensive Plan" (PDF). Archived from the original (PDF) on October 31, 2007. Retrieved November 7, 2007. ^ a b "The State Dining Room". White House Historical Association. Archived from the original on October 2, 2006. Retrieved November 2, 2007. ^ "Jefferson Describes the White House". Original Manuscripts and Primary Sources. Shapell Manuscript Foundation. ^ John Whitcomb, Real Life at the White House: 200 Years of Daily Life at America's Most Famous Residence. Routledge, 2000. ISBN 978-0-415-92320-0. p. 15. ^ a b "The East Room". White House Historical Association. Archived from the original on October 7, 2007. Retrieved November 2, 2007. ^ "Treasure hunt or modern-day pirates?". canada.com. 2006. Archived from the original on December 3, 2007. Retrieved January 28, 2011. ^ Usborne, David (November 27, 2005). "British warship sunk during war with US may hold lost treasures of White House". The Independent. London. Retrieved January 28, 2011. ^ Young, G.F.W. "HMS Fantome and the British Raid on Washington August 1814". Royal Nova Scotia Historical Society Journal. 10: 132–145. ^ Haas, Irvin. Historic Homes of the American Presidents. New York: Dover Publishing, 1991, p. 30. ^ Michael W. Fazio and Patrick A. Snadon (2006). The Domestic Architecture of Benjamin Henry Latrobe. The Johns Hopkins University Press. pp. 368–370. ^ a b "Architectural Improvements: 1825–1872". The White House Museum. Retrieved November 2, 2007. ^ Johnson, Michael (September 15, 2006). "A chateau fit for a president". International Herald Tribune. Archived from the original on March 14, 2007. Retrieved November 2, 2007. ^ a b c d e Epstein, Ellen Robinson (1971–1972). "The East and West Wings of the White House". Records of the Columbia Historical Society. ^ Reeves, Thomas C. (1975). Gentleman Boss. NY, NY: Alfred A. Knopf. p. 268. ISBN 978-0-394-46095-6. ^ Reeves, Thomas C. (1975). Gentleman Boss. NY, NY: Alfred A. Knopf. pp. n473. ISBN 978-0-394-46095-6. ^ Reeves, Thomas C. (1975). Gentleman Boss. NY, NY: Alfred A. Knopf. p. 269. ISBN 978-0-394-46095-6. ^ "The Grand Illumination: Sunset of the Gaslight Age, 1891". The White House Historical Association. Archived from the original on May 7, 2011. Retrieved December 12, 2013. ^ "The Entrance Hall". The White House Museum. Retrieved December 12, 2013. ^ "Theodore Roosevelt Renovation, 1902". The White House Museum. Retrieved December 12, 2013. ^ Abbott & Rice 1998, p. 17. ^ a b c "Truman Reconstruction: 1948–1952". White House Museum. Retrieved November 7, 2007. ^ Slesin, Suzanne (June 16, 1988). "Fit for Dignitaries, Blair House Reopens Its Stately Doors". The New York Times. Retrieved November 9, 2007. ^ "Mrs. Truman Shows Off White House To News Writers". Palm Beach Post. UP. March 24, 1952. p. 7. Archived from the original on January 25, 2013. Retrieved March 29, 2012. ^ "Library Art and Furnishings". The White House. Archived from the original on January 24, 2001. Retrieved November 7, 2007. ^ a b c "Kennedy Renovation: 1961–1963". White House Museum. Retrieved November 7, 2007. ^ "Jacqueline Kennedy in the White House". John F. Kennedy Presidential Library and Museum. p. 3. Archived from the original on March 3, 2009. Retrieved November 9, 2007. ^ "Jackie Kennedy's devotion to White House revealed". CBS News. February 14, 2012. Retrieved April 7, 2015. ^ Abbott & Rice 1998, p. 29. ^ "Architecture: 1970s". White House Historical Association. Archived from the original on January 1, 2011. Retrieved December 7, 2008. ^ "Executive Order 11145—Providing for a Curator of the White House and establishing a Committee for the Preservation of the White House". The U.S. National Archives and Records Administration. Retrieved November 8, 2007. ^ Caroli, Betty Boyd (January 3, 2008). "Pat Nixon: American first lady". Encyclopædia Britannica, Inc. Retrieved January 21, 2017. ^ "First Lady Biography: Pat Nixon". The National First Ladies Library. 2005. Retrieved November 8, 2007. For the White House itself, and thus for the American people, Pat Nixon also decided to accelerate the collection process of fine antiques as well as historically associative pieces, adding some 600 paintings and antiques to the White House Collection. It was the single greatest collecting during any Administration. ^ "A Press Pool". WhiteHouse.gov. ^ "Ask the White House". The White House. May 9, 2005. Retrieved December 7, 2008. ^ "Technology: 1980s". White House Historical Association. Archived from the original on December 2, 2008. Retrieved December 7, 2008. ^ "Maine college to auction off former White House solar panels". October 28, 2004. Archived from the original on December 6, 2004. Retrieved January 31, 2010. ^ a b Burdick, Dave (January 27, 2009). "White House Solar Panels: What Ever Happened To Carter's Solar Thermal Water Heater? (VIDEO)". Huffington Post. Retrieved January 31, 2010. ^ a b "Decorative Arts: 1980s". White House Historical Association. Archived from the original on January 17, 2011. Retrieved December 7, 2008. ^ a b Koncius, Jura (November 12, 2008). "White House makeover". The Californian. Archived from the original on December 6, 2008. Retrieved December 7, 2008. ^ "SOLAR ENERGY IS BACK AT THE WHITE HOUSE". ^ "Solar panels installed on White House roof". Fox News. August 15, 2013. ^ News, ABC. "White House Finally Gets Solar Panels". ^ Ted Johnson (July 23, 2011). "Now playing at the White House: East Wing holds movie theater for First Family and friends". Variety. Retrieved November 19, 2012. ^ "White House Residence First Floor". White House Museum. Retrieved November 9, 2007. ^ "White House Residence Ground Floor". White House Museum. Retrieved November 9, 2007. ^ "White House Residence Second Floor". White House Museum. Retrieved November 9, 2007. ^ "White House Residence Third Floor". White House Museum. Retrieved November 9, 2007. ^ "Debates and Decisions: Life in the Cabinet Room". The White House. Retrieved November 9, 2007. ^ "White House History and Tours". The White House. Archived from the original on November 22, 2002. Retrieved November 9, 2007. ^ a b Mike Allen (July 7, 2007). "White House Press Room to reopen". The Politico. ^ "White House Big Dig wraps up, but the project remains shrouded in mystery". New York Daily News. Associated Press. September 13, 2012. Retrieved February 9, 2013. ^ Graham Smith (January 31, 2012). "It's official! Obama will definitely be out of the Oval Office next year... when it closes for renovation". Daily Mail. London. Retrieved February 9, 2013. ^ "The West Wing of The West Wing". The White House Museum. ^ "White House Magnolia Tree Planted by Andrew Jackson Will Be Cut Down". Smithsonian Magazine. December 28, 2017. Retrieved December 28, 2017. ^ "The story of the White House's famous magnolia tree". Washington Post. December 27, 2017. Retrieved December 28, 2017. ^ "Michelle Obama Goes Organic and Brings in the Bees". Washington Whispers. March 28, 2009. Retrieved August 15, 2010. ^ Freeze, Christopher. "The Time a Stolen Helicopter Landed on the White House Lawn - Robert Preston's wild ride". Air & Space. Smithsonian. Retrieved March 22, 2017. ^ "White House security scares". BBC News. February 7, 2001. ^ Joe Johns; Kelli Arena; Kathleen Koch (May 12, 2005). "Intruding pilots released without charges". CNN. Retrieved November 8, 2007. ^ "Public Report of the White House Security Review". Order of the Secretary of the Treasury. Retrieved November 8, 2007. ^ "Statement of Committee of 100 on the Federal City and The National Coalition to Save Our Mall". National Coalition to Save Our Mall, Inc. 2004. Archived from the original on April 25, 2003. Retrieved November 8, 2007. ^ "Visiting the White House". The White House. Archived from the original on September 13, 2001. Retrieved November 8, 2007. ^ Hennessey, Kathleen (March 5, 2013). "White House tours canceled due to federal budget cuts". LA Times. Retrieved March 6, 2013. ^ "White House Tours To Resume In November (With A Catch)". International Business Times. Retrieved April 19, 2014. ^ "Norske våpen vokter presidenten : Gründer Økonomisk Rapport". Grunder. January 31, 2006. Archived from the original on August 1, 2012. Retrieved August 15, 2010. ^ "Norge sikret innsettelsen av Bush – Nyheter". Dagbladet. March 13, 2006. Retrieved August 15, 2010. Abbott, James A.; Rice, Elaine M. (1998). Designing Camelot: The Kennedy White House Restoration. New York: Van Nostrand Reinhold. ISBN 0442025327. Abbott, James A. A Frenchman in Camelot: The Decoration of the Kennedy White House by Stéphane Boudin. Boscobel Restoration Inc.: 1995. ISBN 978-0-9646659-0-3. Abbott, James A. Jansen. Acanthus Press: 2006. ISBN 978-0-926494-33-6. Clinton, Hillary Rodham. An Invitation to the White House: At Home with History. Simon & Schuster: 2000. ISBN 978-0-684-85799-2. Garrett, Wendell. Our Changing White House. Northeastern University Press: 1995. ISBN 978-1-55553-222-2. Guidas, John. The White House: Resources for Research at the Library of Congress. Library of Congress, 1992. Huchet de Quénetain, Christophe.De quelques bronzes dorés français conservés à la Maison-Blanche à Washington D.C.in La Revue, Pierre Bergé & associés, n°6, mars 2005 pp.54–5. OCLC 62701407. Kenny, Peter M., Frances F. Bretter and Ulrich Leben. Honoré Lannuier Cabinetmaker from Paris: The Life and Work of French Ébiniste in Federal New York. The Metropolitan Museum of Art, New York and Harry Abrams: 1998. ISBN 978-0-87099-836-2. Klara, Robert. The Hidden White House: Harry Truman and the Reconstruction of America's Most Famous Residence. Thomas Dunne Books: 2013. ISBN 978-1-2500-0027-9. Kloss, William. Art in the White House: A Nation's Pride. White House Historical Association in cooperation with the National Geographic Society, 1992. ISBN 978-0-8109-3965-3. Leish, Kenneth. The White House. Newsweek Book Division: 1972. ISBN 978-0-88225-020-5. Monkman, Betty C. The White House: The Historic Furnishing & First Families. Abbeville Press: 2000. ISBN 978-0-7892-0624-4. New York Life Insurance Company. The Presidents from 1789 to 1908 and the History of the White House. New York Life Insurance Company: 1908. Penaud, Guy Dictionnaire des châteaux du Périgord. Editions Sud-Ouest: 1996. ISBN 978-2-87901-221-6. Phillips-Schrock, Patrick. The White House: An Illustrated Architectural History (Jefferson, NC: McFarland, 2013) 196 pp. Seale, William. The President's House. White House Historical Association and the National Geographic Society: 1986. ISBN 978-0-912308-28-9. Seale, William, The White House: The History of an American Idea. White House Historical Association: 1992, 2001. ISBN 978-0-912308-85-2. West, J.B. with Mary Lynn Kotz. Upstairs at the White House: My Life with the First Ladies. Coward, McCann & Geoghegan: 1973. ISBN 978-0-698-10546-1. The White House: An Historic Guide. White House Historical Association and the National Geographic Society: 2001. ISBN 978-0-912308-79-1. "White House Holiday Tour with Laura Bush". C-SPAN. December 3, 2008. "White House Tour". C-SPAN. July 7, 1998. "Popular video tours". C-SPAN. Retrieved August 1, 2015. Dana Marie Perino (born May 9, 1972) is an American political commentator and author who served as the twenty-fourth White House Press Secretary, serving under President George W. Bush from September 14, 2007, to January 20, 2009. She was the second female White House Press Secretary, after Dee Dee Myers, who served during the Clinton Administration. She is currently a political commentator for Fox News, while also serving as a co-host of the network's talk show The Five, and is a book publishing executive at Random House. On October 2, 2017, she began hosting The Daily Briefing with Dana Perino on Fox News. Richard Bruce Cheney (; born January 30, 1941) is an American politician and businessman who served as the 46th vice president of the United States from 2001 to 2009. He has been cited as the most powerful vice president in American history. At the same time he has been among the least favored politicians in the history of the US: his approval rating when leaving office was only 13%.Cheney was born in Lincoln, Nebraska, and grew up in Casper, Wyoming. He attended Yale and then the University of Wyoming, at the latter of which he earned a BA and an MA in Political Science. He began his political career as an intern for Congressman William A. Steiger, eventually working his way into the White House during the Nixon and Ford administrations, where he later served as the White House chief of staff, from 1975 to 1977. In 1978, Cheney was elected to the U.S. House of Representatives representing Wyoming's at-large congressional district from 1979 to 1989; he was reelected five times, briefly serving as House minority whip in 1989. Cheney was selected to be the secretary of defense during the presidency of George H. W. Bush, holding the position for the majority of Bush's term from 1989 to 1993. During his time in the Department of Defense, Cheney oversaw the 1991 Operation Desert Storm, among other actions. Out of office during the Clinton administration, Cheney was the Chairman and CEO of Halliburton Company from 1995 to 2000. With the increase in technological and global advancement, the size of the White House staff has increased to include an array of policy experts to effectively address various fields of the modern day. There are about 4,000 positions in the Executive Office of the President, most of which do not require confirmation from the U.S. Senate. The budget for the EOP in FY 2017 was $714 million.The Executive Office is overseen by the White House Chief of Staff, since January 2, 2019 held by acting Chief of Staff, Mick Mulvaney, appointed by Donald Trump, the current and 45th President of the United States. The First Lady of the United States (FLOTUS) is the title held by the hostess of the White House, usually the wife of the President of the United States, concurrent with the President's term in office. Although the First Lady's role has never been codified or officially defined, she figures prominently in the political and social life of the nation. Since the early 20th century, the First Lady has been assisted by official staff, now known as the Office of the First Lady and headquartered in the East Wing of the White House. Melania Trump is the current First Lady of the United States, as wife of 45th president, Donald Trump. While the title was not in general use until much later, Martha Washington, the wife of George Washington, the first U.S. President (1789–1797), is considered to be the inaugural First Lady of the United States. During her lifetime, she was often referred to as "Lady Washington".Since the 1790s, the role of First Lady has changed considerably. It has come to include involvement in political campaigns, management of the White House, championship of social causes, and representation of the president at official and ceremonial occasions. Because first ladies now typically publish their memoirs, which are viewed as potential sources of additional information about their husbands' administrations, and because the public is interested in these increasingly independent women in their own right, first ladies frequently remain a focus of attention long after their husbands' terms of office have ended. Additionally, over the years individual first ladies have held influence in a range of sectors, from fashion to public opinion on policy. Historically, should a president be unmarried, or a widower, the president usually asks a relative or friend to act as White House hostess. There are four living former first ladies: Rosalynn Carter, wife of Jimmy Carter; Hillary Clinton, wife of Bill Clinton; Laura Bush; wife of George W Bush and Michelle Obama, wife of Barack Obama. As of 2019, the only former First Lady who has run for or held public office is Hillary Clinton. Jacqueline Lee Kennedy Onassis (née Bouvier ; July 28, 1929 – May 19, 1994) was an American socialite, book editor, and First Lady of the United States during the presidency of John F. Kennedy from January 1961 until his assassination in November 1963. Bouvier was born in Southampton, New York, to Wall Street stockbroker John Vernou Bouvier III and his wife, Janet Lee Bouvier, in 1929. In 1951, she graduated with a Bachelor of Arts in French literature from George Washington University and went on to work for the Washington Times-Herald as an inquiring photographer.In 1952, Bouvier met then-Congressman John F. Kennedy at a dinner party in Washington. Following his election to the Senate in 1952, the couple married on September 12, 1953, in Newport, Rhode Island. They had four children, two of whom died in infancy. Following her husband's election to the presidency in 1960, Jacqueline was known for her highly publicized restoration of the White House and emphasis on arts and culture, as well as for her style, elegance, and grace. She was 31 years old when her husband was inaugurated and was the youngest first lady since Frances Folsom Cleveland Preston. Nancy Davis Reagan (born Anne Frances Robbins; July 6, 1921 – March 6, 2016) was an American film actress and the wife of Ronald Reagan, the 40th President of the United States. She was the First Lady of the United States from 1981 to 1989. She was born in New York City. After her parents separated, she lived in Maryland with an aunt and uncle for six years. When her mother remarried in 1929, she moved to Chicago and later took the name Davis from her stepfather. As Nancy Davis, she was a Hollywood actress in the 1940s and 1950s, starring in films such as The Next Voice You Hear..., Night into Morning, and Donovan's Brain. In 1952, she married Ronald Reagan, who was then president of the Screen Actors Guild. They had two children together. Reagan was the First Lady of California when her husband was Governor from 1967 to 1975, and she began to work with the Foster Grandparents Program. Reagan became First Lady of the United States in January 1981, following her husband's victory in the 1980 presidential election. Early in his first term, she was criticized largely due to her decision to replace the White House china, which had been paid for by private donations. Following years of lax formality, she decided to restore a Kennedyesque glamour to the White House, and her interest in high-end fashion garnered much attention as well as criticism. She championed recreational drug prevention causes when she founded the "Just Say No" drug awareness campaign, which was considered her major initiative as First Lady. More discussion of her role ensued following a 1988 revelation that she had consulted an astrologer to assist in planning the president's schedule after the attempted assassination of her husband in 1981. She generally had a strong influence on her husband and played a role in a few of his personnel and diplomatic decisions. After Ronald Reagan's term as president ended, the couple returned to their home in Bel Air, Los Angeles, California. Nancy devoted most of her time to caring for her husband, who was diagnosed with Alzheimer's disease in 1994, until his death at the age of 93 on June 5, 2004. Reagan remained active within the Reagan Library and in politics, particularly in support of embryonic stem cell research, until her death from congestive heart failure at age 94 on March 6, 2016. Omarosa Onee Manigault Newman (; born February 5, 1974), often mononymously known as Omarosa, is an American reality television show participant, writer, and former political aide to President Donald Trump. She became widely known as a contestant on the first season of NBC's reality television series The Apprentice. After becoming assistant to the president and director of communications for the Office of Public Liaison during the Trump administration in January 2017, Newman resigned the White House on December 13, 2017. Subsequently, she competed on the first season of Celebrity Big Brother, making it to the final five of the season. In August 2018, Newman published Unhinged, detailing her tenure at the White House and criticizing Trump and his administration. Two days before the book was released, she released the first of as many as 200 secret tapes she recorded during her White House tenure. As of 25 April 2019, she has released four tapes. The first tape she released, which was secretly recorded inside the Situation Room, was described as "one of the worst White House security breaches ever," though the tape is thought not to violate the Espionage Act. Opened in 1909, the room features three large south-facing windows behind the president's desk, and a fireplace at the north end. It has four doors: the east door opens to the Rose Garden; the west door leads to a private study and dining room; the northwest door opens onto the main corridor of the West Wing; and the northeast door opens to the office of the president's secretary. The Resolute desk is a nineteenth-century partners' desk used by several presidents of the United States in the White House Oval Office as the Oval Office desk. It was a gift from Queen Victoria to President Rutherford B. Hayes in 1880 and was built from the English oak timbers of the British Arctic exploration ship HMS Resolute. Franklin Roosevelt requested the addition of a door with the presidential seal to conceal his leg braces. Many presidents since Hayes have used the desk at various locations in the White House.The desk was removed from the White House only once, after the 1963 assassination of President John F. Kennedy, when President Lyndon Johnson allowed it to go on a traveling exhibition with the Kennedy Presidential Library. After this it was put on display in the Smithsonian Institution. Sarah Elizabeth Huckabee Sanders (born Sarah Elizabeth Huckabee, August 13, 1982), is an American campaign manager and political adviser who serves as the White House Press Secretary under President Donald Trump. Sanders is the third woman to hold the role. With the release of the Mueller Report in April 2019, it was shown that Sanders had admitted to investigators that she had made false statements to the public as press secretary. The West Wing is regarded as one of the greatest and most influential television series. It has been ranked among the best television shows of all time in publications such as Time, TV Guide, Empire, Rolling Stone, and the New York Daily News. The Writers Guild of America ranked it no. 10 in its "101 Best-Written TV Series" list. It has received praise from critics, political science professors, and former White House staffers and has been the subject of critical analysis. The West Wing received a multitude of accolades, including two Peabody Awards, three Golden Globe Awards, and 26 Primetime Emmy Awards, including the award for Outstanding Drama Series, which it won four consecutive times from 2000–2003. The show's ratings waned in later years following the departure of series creator Sorkin after the fourth season (Sorkin wrote or co-wrote 85 of the first 88 episodes), yet it remained popular among high-income viewers, a key demographic for the show and its advertisers, with around 16 million viewers. The White House National Security Council (NSC) is the principal forum used by the President of the United States for consideration of national security, military matters, and foreign policy matters with senior national security advisors and Cabinet officials and is part of the Executive Office of the President of the United States. Since its inception under Harry S. Truman, the function of the Council has been to advise and assist the President on national security and foreign policies. The Council also serves as the President's principal arm for coordinating these policies among various government agencies. The Council has counterparts in the national security councils of many other nations. The Watergate scandal was a major political scandal that occurred in the United States during 1972 to 1974, following a break-in by five men at the Democratic National Committee (DNC) headquarters at the Watergate office complex in Washington, D.C. on June 17, 1972, and President Richard Nixon's administration's subsequent attempt to cover up his involvement. After the five burglars were caught and the conspiracy was discovered—chiefly through the work of a few journalists, Congressional staffers and an election-finance watchdog official—Watergate was investigated by the United States Congress. Meanwhile, Nixon's administration resisted its probes, which led to a constitutional crisis.The term Watergate, by metonymy, has come to encompass an array of clandestine and often illegal activities undertaken by members of the Nixon administration. Those activities included such dirty tricks as bugging the offices of political opponents and people of whom Nixon or his officials were suspicious. Nixon and his close aides also ordered investigations of activist groups and political figures, using the Federal Bureau of Investigation (FBI), the Central Intelligence Agency (CIA), and the Internal Revenue Service (IRS) as political weapons.The scandal led to the discovery of multiple abuses of power by members of the Nixon administration, the commencement of an impeachment process against the president, and Nixon's resignation. The scandal also resulted in the indictment of 69 people, with trials or pleas resulting in 48 being found guilty, many of whom were top Nixon officials.The affair began with the arrest of five men for breaking into the DNC headquarters at the Watergate complex on Saturday, June 17, 1972. The FBI investigated and discovered a connection between cash found on the burglars and a slush fund used by the Committee for the Re-Election of the President (CRP), the official organization of Nixon's campaign. In July 1973, evidence mounted against the president's staff, including testimony provided by former staff members in an investigation conducted by the Senate Watergate Committee. The investigation revealed that Nixon had a tape-recording system in his offices and that he had recorded many conversations.After a series of court battles, the Supreme Court of the United States unanimously ruled that the president was obligated to release the tapes to government investigators (United States v. Nixon). The tapes revealed that Nixon had attempted to cover up activities that took place after the break-in, and to use federal officials to deflect the investigation. The White House Correspondents' Association (WHCA) is an organization of journalists who cover the White House and the President of the United States. The WHCA was founded on February 25, 1914 by journalists in response to an unfounded rumor that a United States congressional committee would select which journalists could attend press conferences of President Woodrow Wilson.The WHCA operates independently of the White House. Among the more notable issues handled by the WHCA are the credentialing process, access to the President and physical conditions in the White House press briefing rooms. Its most high-profile activity is the annual White House Correspondents' Dinner, which is traditionally attended by the President and covered by the news media. Not every member of the White House press corps is a member of the White House Correspondents' Association. The White House Military Office (WHMO)—an entity of the White House Office, which itself is a sub-unit of the Executive Office of the President—provides military support for White House functions, including food service, presidential transportation, medical support, emergency medical services, and hospitality services. The White House Military Office is headed by the White House Military Office Director.